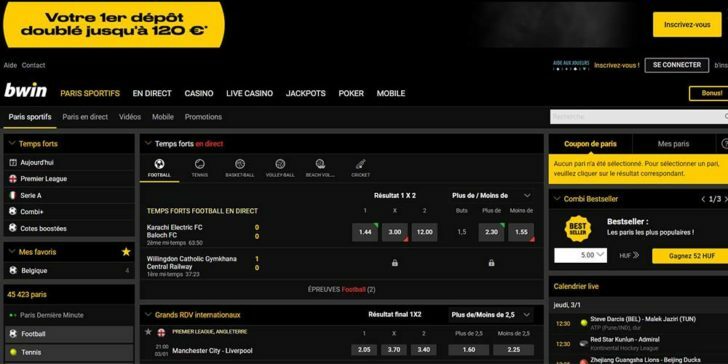 Bwin.be Sportsbook is one of the online sportsbooks with highest reputation on the market in regard of security of deposits, the customers-friendly betting conditions, and the user friendly interface on their website. The website is owned and operated by GVC Holdings PLC (LSE:GVC), a leading e-gaming operator on the B2C and B2B markets, whose most popular sports betting brand is bwin. The bwin.be website in particular is run by the CASINO KURSAAL OOSTENDE SA, registered in Belgium,but operating its activities from Gibraltar on the basis of sports betting and casino licenses issued by the Government of Gibraltar. Bwin.be Sportsbook has one of the most diverse sports betting offers on the market. More than 30 sports played worldwide make up an offer of thousands of matches for betting on daily basis. From football, handball, basketball, rugby, hockey to table tennis, boxing, diving, sky jumping. The possibilities for betting on political events are also not lacking from their offer as well as the betting on major entertainment shows such as the Academy Awards winners. 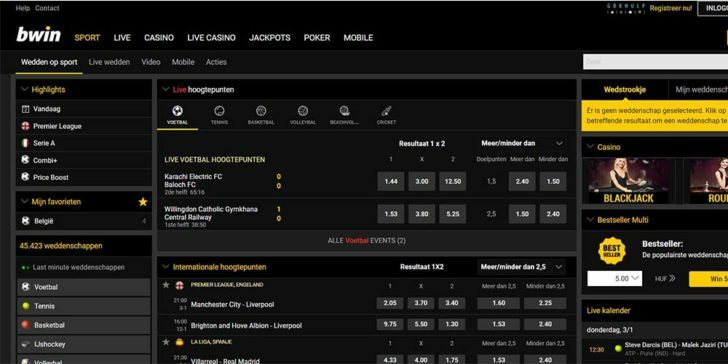 In addition, the Bettorlogic and GamesOS softwarethat bwin.be is using allows online bettors to follow their live betting games via live stream. Under the betting section one can find all the Live Betting events on offer. Beside the sports betting opportunities online gamers can also access exciting casino and poker games in the respected sections, easily accessible from the home page. Starting from the end of October 2016, bwin.be gives to Belgiam sportsbetting fans another reason to join their site. Their novel sportsbetting offer allows players to mathc their first deposits by 100% bonusof up to EUR 120. In order to withdraw this bonus players are only required to wager 3 times the bonus and the first deposit amount at incredible odds of just 1.4 or lower. 100% Max. EUR 120 Play!